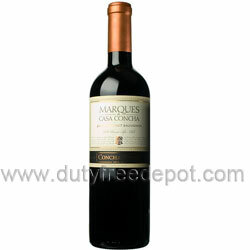 Marques de Casa Concha Cabernet Sauvignon is an outstanding dark ruby red wine with bell pepper, smoke and eucalyptus aromas. The wine is aged for 18 months in one-, two and three-year-old French oak barrels, and then aged a further 2 months after bottling. It is an appetizing, smooth, well-rounded and tasteful wine. Black currants flavors, well-balanced with a long finish. Enjoy this fine Cabernet Sauvignon with red meats, cheeses and pasta.